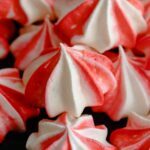 Fill the bag with meringue and pipe "kisses" on to the prepared baking sheet, spacing them 1 inch apart. If you don't have piping bags, you can use a ziptop bag with the corner cut off. Or you can use a spoon to drop mounds of meringue onto your baking sheet.